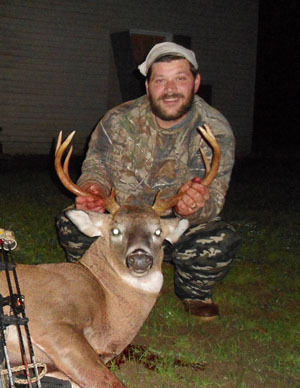 On 10/28/12 around 5pm I was freezing so I decided it was time to come down out of the stand and make my way in. After loading up my bag, I looked up, saw the rear end of a deer passing through the trees. I pulled out my bleat and used it once. The deer turned and headed towards the sound, his head was up smelling for the doe urine I had put out about 35 yards from my stand. I drew back and let ‘er go. The deer ran off about 60 yards before dropping. 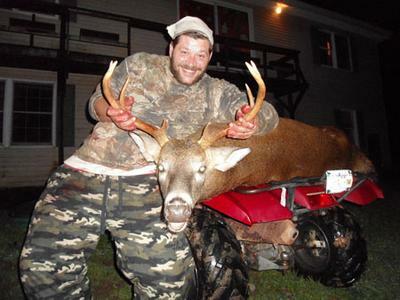 I scored a nice 8-point buck outback of my house in the Town of Palermo, Oswego County. This was my first buck with a bow! It was weighed after two days of hanging and weighed in at 190 lbs field dressed. I will be getting it scored once it goes to the taxidermists.